The legend of El Dorado stems from a Spaniard, Juan Rodriguez Freyle, watching a High Priest of the Muisca getting covered in gold dust and jumping in Lake Guatavita, near Bogotá, in a religious ceremony that makes the Pope's big hat and incense burning look fairly underwhelming. Naturally, the Spanish decided that they themselves were far better placed to use all the gold responsibly, and set about destroying the complex societies that had flourished in Colombia prior. Before there was Colombia, there was the extractive industry. The legend of El Dorado stems from a Spaniard, Juan Rodriguez Freyle, watching a High Priest of the Muisca getting covered in gold dust and jumping in Lake Guatavita, near Bogotá, in a religious ceremony that makes the Pope's big hat and incense burning look fairly underwhelming. Naturally, the Spanish saw this profligacy and wrongheaded veneration of the Sun God Sue, decided that they themselves were far better placed to use all the gold responsibly, and set about destroying the complex societies that had flourished in Colombia prior. 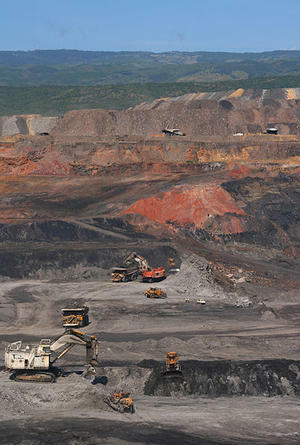 Coal Mine, El cerrejón. Photo Credit: Tanenhaus, Wikimedia Commons. Legends of cities of gold (La Ciudad Blanca, the Seven Cities of Cibola) drove men who nowadays would rightly be considered genocidaires (or go-getting entrepreneurs in the global commodities market) across the Atlantic, far from their families, to an uncertain fate—an alien environment full of strange gods, beautiful birds, jeweled beetles; the sort of landscapes working class Europeans hadn't seen since they'd left the Rift Valley and laid it to waste. The Spanish Empire was built on this gold (and other commodities they could “extract,” worked by the stolen people of another ravaged continent.) The Muisca did less well. Such was the conquest of the New World, and the Spanish didn’t know the half of it. Colombia is the world’s fourth-largest producer of coal; it has 60 percent of the world's emeralds and is the world's second-largest nickel mine; it is a net exporter of oil; it has copper and rare earths and all the other weird stuff you never think about in spades—silica sands, coltan, and so on—that totals more than the worth of Belgium. And gold. Colombian gold has become increasingly visible as illegal gold mining has been on the rise in recent years. In 2010/11, the government of Colombia estimated 87 percent of all the gold mines in the country were operating illegally, and recently estimated that this number has grown. At the local level (that is, in the Colombian jungle, not at your highstreet drug dealer), the price of a kilo of gold can be 19 times that of a kilo of cocaine, and profit returns are estimated to be five times that of coca. In the Bajo Cauca region of the Antioquia/Córdoba borderlands there are an estimated 1000 illegally-operated diggers in 9 municipalities, generating $2 million a month in extortion payments. The FARC Bloc which dominates the region I work in, the Northwestern Bloc, AKA the Ivan Rios Bloc, is estimated to make $3 million a month from illegal gold mining alone. InsightCrime’s recent report on Buriticá, near Urabá in Antioquia, illustrates just how rapidly much of the North West region is beginning to resemble the Deadwood-era South Dakota gold rush, but with automatic weaponry. In areas close by, I have talked to campesinos who are reluctant to protest against multinational companies who have been buying mining concessions bordering their collective land, out of fear of what other groups such a protest may attract. Gold mining is now the primary source of funding for Colombia's illegal armed groups in at least 8 Departments; it is little wonder the armed groups of Colombia have diversified their business interests. Coal mining is similarly implicated. Perhaps the most striking example this year is related to one of the largest open-pit mines in the world, Cerrejón in La Guajira, where in August paramilitary group Los Rastrojos threatened Colombian opposition parliamentarians, protesters, lawyers, trade unionists, and anyone else “attacking the Santos Government’s good and noble intentions of peace and democratic prosperity and halting the progress generated by multinationals such as [mining companies] Glencore, Drummond, Pacific Rubiales, and AngloGold Ashanti.” Not for nothing is Colombia the most dangerous place in the world to be a trade unionist, with more than 4,000 murdered in the past 20 years. Nonetheless, it is clear that over the past decade, the government has seen the future of the Colombian economy, and it is underground. The pivot toward mining has seen the governments of Uribe and Santos offer multinational mining corporations tax breaks and investment incentives, widening the distribution of mining rights, and making it less and less likely that the huge profits made by the various arms of the extractive industry are ever reinvested into the Colombian communities who have suffered most from these policies. However, the infrastructure is relatively poor, there is significant institutional weakness, and the vast numbers of under-regulated sites have attracted violent armed actors to the market—a shift that in general depresses the direct foreign investments in a market. The FARC's bombing of oil pipelines and the ELN's kidnapping of geologists is, on the whole, also seen as unhelpful. The FARC has previously provided the political alibi for the Colombian State to extend its power and close the available space for dissenting opinion, civil society organizations, and so on, through increasing the power of its military, tacitly backing the paramilitaries who provide the pro-state, pro-business counterbalance to the FARC, and tightening the hegemonic security state that has dominated Colombian politics for as long as anyone can remember. Fighting the FARC has definitely been something the Colombian government could do without, but it hasn't been without its benefits. These benefits the State has been quick to take advantage of, as amoral national security apparatus are wont to do (shout out the USA on this one, market leader in amoral national security apparatus). But now, allowing the war to continue in its most recent form would mean forfeiting some of those public/private partnerships and foreign direct investments by the wealthiest corporations in the world: those various extract and export industries. But if the FARC were to demobilize, it would really open up the doors for some proper neoliberal development, some direct foreign investment, and a real roll-out of a new national energy and mining policy—a new way forward for the 21st century of Colombian political-economy in gold, coal, emeralds, oil, rare earths, and all the stuff you don’t really think about but turns out is worth more than Belgium (you can’t hear it, but I'm using a sarcastic tone). In addition to learning what the FARC and government have agreed on with respect to agricultural policy (the first point of the peace process agenda), it will be most interesting to observe the ways the issue of mining is dealt with in relation to agricultural communities, land titles, exploration rights, taxes, and so on. The recent interest in the issue of mining in Colombia is not just a factor of the strikes at Drummond, or of the increase in human rights abuses across northern Colombia in relation to mining companies, but also of its centrality to the government’s plans for the next 50 years. The extractive industry is a—possibly the—core issue that has a direct impact on our understanding of why the government returned to the negotiation table, and how crucial it is to government plans that the negotiations are successful for the state. However, readers of Latin American history (not to mention NACLA) will remember the Muisca, and the last time the international extractive industry came to Colombia—even before it was Colombia. Luke Finn is a writer and international accompanier with Fellowship of Reconciliation Peace Presence in Colombia. He graduated from the Humanitarian and Conflict Response Institute, University of Manchester. Follow @Peace_Presence and on Facebook.